Be patient in the queue. They are often busy. These guys are legends. Top class work and top attitude. Prices well below what you would pay in the centre of town. I have taken them shoes, boots, sandals, bags, men's, women's and children's ... the works and should have left them feedback long before now. Proper independent business bothered about customer service. I've been using Callis for years and really should have left a review before. They're great. I took some lovely little quite delicate leather ankle boots in yesterday as the sole had started to come away in all this wet weather. They're really not designed for this much rain - soft thin leather, so my fault. They looked really quite shabby and scuffed too, but I was told that he would stick, polish and make them look as good as new and I could collect later that afternoon. I can't believe the difference. Just £6.50 and it's like having nearly new boots again. Previously they have reheeled, mended bags, boots and shoes, stitched and polished for me and given a new lease of life to anything worth saving. Go to Callis! 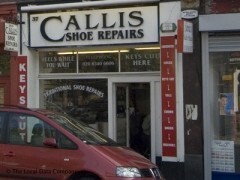 I have been visiting Callis to have my shoes re-heeled, soled or restored as long as I can remember. I have a pair of Churches that are still going, largely because of the chaps at Callis. Like Trigger's broom, I have had them mended and bits replaced so often there is very little original remaining. The Callis guys are friendly and do a great job at a very reasonable price and, in these days of corporate franchises taking over everything, I am so glad they are still there. In fact, I have two pairs there now. I've been in twice now and the service is very good. They've done an excellent job both times, particularly on the boots I took in where the heel had fallen off. Would definitely recommend Callis. I have been a customer at Callis for as long as I have been wearing the kind of shoes that when worn you repair or re-heel rather then throw away! The business is ran by a group of males who always greet me with a smile and polite chit chat when I go in. The quality of their work and speed of service is second to none! Their loyalty card where you use their service 5 times and get a re-heel for free is also a great incentive for use. These gentlemen have fixed both men's and women's shoes, and bags for us to a terrific standard at reasonable prices. Everything from complete resoles to metal bag fixtures. I have always found them good natured and helpful, and work has always been ready when promised. Cannot ask for any more. This is my first posting because the negative review was such a surprise. I have been coming to Callis for over 15 years and they have been nothing but friendly and helpful. I am appalled to read the negative comments about these hardworking obliging people -- some people! This sounds like a rant, but it's not. It's a true account of the customer service received in Callis today. Today I went to collect my husband's shoes and I was treated terribly. Unfortunately, my husband lost his ticket. I apolgised but the response was 'what, do you expect me to spend my time, like a mug, looking for your shoes?'. I can only assume that the guy (manager? Surely not!) was annoyed that they'd had to resole my husband's shoes for free because the first job they'd done wasn't good enough, because he followed up with, 'I work for free and then you lose your ticket. How ironic'. When I told him I was shocked at his treatment of me, he said, 'I can speak to you how I like because I am a man; I am THE man; I own this shop. Now, bye bye then, off you go!' and he shooed me off the premises. I'm eight months pregnant and probably a bit hormonal (cried when I left the shop) but another customer came to ask me if I was ok. She also said that she found the same guy extremely rude, but went there because, so far, they'd done an ok job.